What to do when the SA account password is lost in SQL Server 2008? You may have faced the issue of losing the SQL Server SA password. Perhaps you followed the security best-practice of removing the built-in\Administrators from the sysadmin server role and now you’ve lost admin access to your SQL Server instance. At this point you may think that the only option is to reinstall SQL Server and attache the database. In this tutorial I’ll show you how to reset SQL Server 2008 (R2) password without reinstalling. 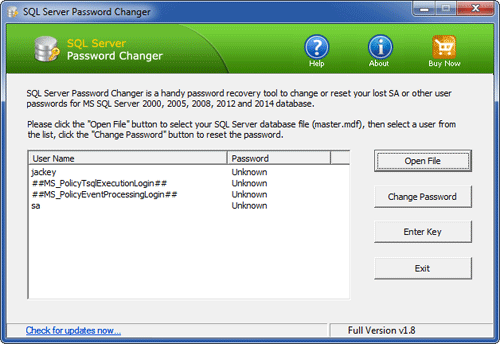 SQL Server Password Changer is a great recovery utility that allows you to change SA password that is stored in the master database file (master.mdf). Here’s how. How to Reset SQL Server 2008 Password without Reinstalling? Click here to download and install the SQL Server Password Changer program on your computer. Click the Open File button. Select the SQL Server 2008 master database file (master.mdf). Typically it is located in the folder: c:\Program Files\Microsoft SQL Server\MSSQL10_50.SQLEXPRESS\MSSQL\DATA\. The program will replace the existing password with your new password, and also unlock your SA account if it’s already locked out or disabled. Now start your SQL Server 2008 instance again and you can then log into the SA account with the new password.